I know...there are road trips to discuss, places to shop, things I've seen...but I really wanted to show you this DIY first. Promise, next blog post will be about cool places to go! So who doesn't have a wool sweater that they accidental shrunk (no worries, Mom, you can still do my laundry when you come to visit). Or a sweater that the moths got to? Holes everywhere! 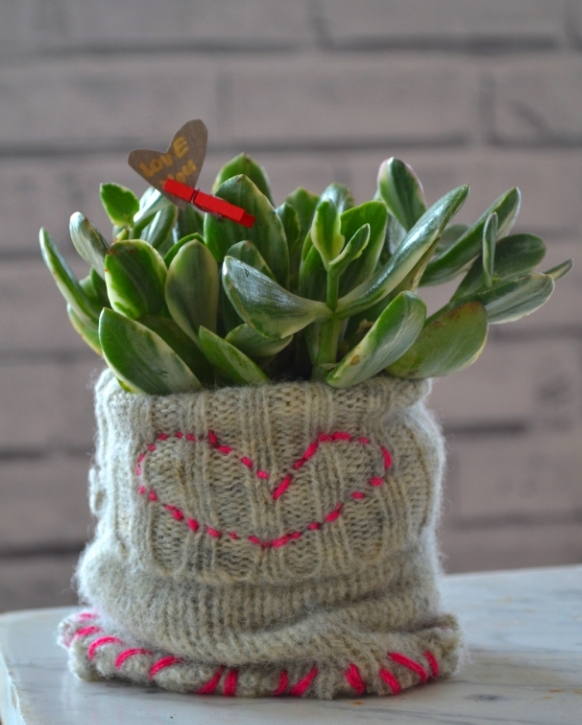 Well, fear not...you can turn that old sweater into a botanical cozy container! Here is how I did it. Holes and Shrunk! This sweater was ready for a repurpose! Then I just used some embroidery thread and hand stitched a piece for the bottom and a heart on the sleeve. I wrapped the plant in wax paper and slide into the sleeve! Check out what I did with the neck of the sweater...lots more to make...have fun!